In 1667, Paris was a filthy crime-ridden mess, and Nicolas de La Reynie was the man hired to clean it up. As Holly Tucker tells it in City of Light, City of Poison: Murder, Magic and the First Police Chief of Paris, the state of the capital made the would-be glorious Sun King of France, Louis XIV, look bad, and he wanted it fixed. And so La Reynie was installed as lieutenant general of police and assigned to get the crime under control. The book tracks his efforts, beginning with fairly straightforward measures like lighting the streets. But gradually he realized he faced a bigger case. Imagine one of those complex modern multi-agency investigations involving violent motorcycle gangs with their fingers in narcotics and illegal weapons and God knows what else, but swap in rogue midwives, fortune-tellers, dodgy priests—and poisoners. The book reads like Law and Order: 17th Century Parisian Poisoners Unit. La Reynie discovered that there was a neighborhood where you could go if you wanted face-whitening creams, love potions, abortions, or even a little something to make your husband drop dead. And it wasn’t just local women shopping for these services, either—sometimes it was women of the court and perhaps even mistresses of Louis XIV himself. The further La Reynie dug, the more gruesome the allegations became. How high did the Affair of the Poisons go? Was the King himself in danger? I spoke to Tucker about the wildness of 17th century Paris and the social contexts that might’ve made poison look like an appealing solution to your problems. Our conversation has been edited for clarity and length and, in one case, a spoiler. Jezebel: Tell me about Paris in the time you’re writing, the late 17th century. It sounds like it was basically Dodge City crossed with the Middle Ages. 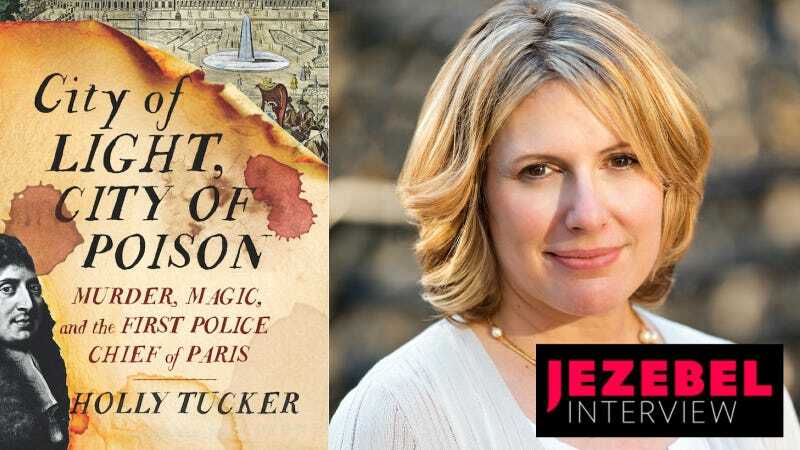 Holly Tucker: Yeah, Paris is not a place you’d want to be. People have asked me if I’d ever want to go back in time to be able to spend a day in the Paris that I write about, and the answer is absolutely no. It was nasty, it was dirty, it was dangerous. People were slubbing around through mud that would be ankle high, that was full of people tossing their chamber pots out, kitchen waste, and on slaughter days sometimes in certain neighborhoods the mud would turn red. Actually, on a regular basis, the mud would turn red. It was also dangerous, because there was no established police force during the time, and also at night there were no lights. It would be pitch dark within the city once the sun went down. The only light that you could get would be just maybe glimmers out of people’s windows. It was a really dangerous place. And of course where there’s dark and dirt and many people living on top of each other, there was also enormous violence as well. And they’d basically just invented handguns right? Well, guns had been around since the 16th century. But the guns actually shifted in that, through new technologies, they were able to make them smaller, and because people wearing these long robes and flowing clothing were able to tuck their guns into their long sleeves and things like that. They were also more accessible, they were much less expensive, and even though the monarchy tried desperately on a regular basis, almost every other year, to make some sort of royal decree limiting who could have guns, it always fell on deaf ears. So the more violent the city got, the more people were having weapons in their homes. The Palais de Justice on the Ile de La Cite, situated in the middle of the Seine, Paris, 1650. Photo via Getty Images. I see. So this is the scene into which steps your protagonist Nicolas de la Reynie. He’s basically hired to clean up the town, right? Right. Paris had become an embarrassment for the Sun King, Louis XIV. Within a matter of months his civil lieutenant, who was over all civil cases in the city, had died, and so had his criminal lieutenant, The criminal lieutenant was actually murdered in his own home, and then later it was discovered that the civil lieutenant was actually poisoned by his own daughter. Louis XIV was understanding that for him—the man who’s building at this point Versailles—there’s no way he’s going to be this magnificent king if his capital city is an embarrassment. That’s why he named Nicolas de la Reynie to really clean up paris, and he gave him far-reaching powers. In fact one of the ways that I see Nicolas de la Reynie is as sort of a mix between a Rudy Giuliani and an Elliot Ness. He’s a really rough guy and he has a clear idea about how he’s going to clean up the city. But at the same time, he [was] delivered this mystery of mob bosses, essentially—these dens of crime with mostly women at the helm who are delivering up poisons and spells and doing all different other types of nasty things. So he comes into Paris to clean it up, and first he does things like install lights—fairly basic police actions. But then he encounters this neighborhood, Montorgeuil, and its network of poisoners and witches and rogue priests and it’s almost like some dark magic motorcycle gang? Tell me a little bit about this world that he comes into and goes head to head with. For people who have visited Paris, it’s surprising to figure out that [this neighborhood is] very close to the Louvre. I’ve walked it many times. It’s a ten-minute walk. It’s an impoverished neighborhood, people are scrapping to make a living in homes that are ramshackle, about ready to fall down, and the main profession for women in this neighborhood was midwifery. This is what is really interesting from a woman’s point of view: midwives in the earlier periods in Europe were considered both fantastic resources, knowledgeable women helping women, but at the same time, because these midwives were present during one of the most important moments in both a woman’s life and also society’s life—you know, childbirth—there was a fear that they had access to secrets they shouldn’t have access to. Just as they could bring a child into the world and help welcome the child into a family, they could also, if they didn’t have a strong moral core, they could also it was believed damn the child to life with the devil or they could do horrible things like dry their umbilical cords and make wicks for witches’ Sabbath candles. Or, in the case of children who may have died during childbirth or worse, a bad midwife/witch had done something horrible to the newborn—that that’s how they got their brooms to fly. Through—isn’t this horrible?—the fat of newborns. So there’s this network of women who are serving other women, and invariably, when you talk about midwives in the 17th century, you tap into all this mythology. And midwives also have this ability to know what herbs to be using not just to promote childbirth, but to stop a pregnancy. But they also know how to help a woman regain her beauty after she’s had a child, to help her stomach shrink. At first la Reynie sorta knows where these clusters of women are operating, and there’s one cluster that’s specifically interesting to him because it’s right next to what’s called the “Court of Miracles,” where a mob boss would get hundreds of people to fan out to different churches and the different areas of Paris during the day and the reason why they called it the Court of Miracles was these people would be trained to put on a show of being infirm or blind or something but they really weren’t. So in the evening, they were miraculously cured. So he already had his sight set on this crime-ridden neighborhood, and he was already concerned about these midwives/witches and stories he was hearing about poison. It was only when he started to connect his dots in his investigation that he began to realize that some of the clients of these women were not just local to the neighborhood. There were reports of women from the courts, beautifully dressed women, coming to a number of these midwives to ask for certain services. Like to have their palms read, to have their fortunes told, to get love potions, or when— those love potions didn’t work, or when they worked with unintended consequences—to cast spells against their beloveds or to buy poisons to kill off family members. And what’s striking, too, is this is all a true story. Which is so bizarre, right? It sounds like it could be a very odd novel, but it’s entirely true. Circa 1668, King Louis XIV of France, (1638 - 1715), king from 1643, in office. He was known as ‘The Sun King’. Photo via Getty. Say you’re somebody going to one of these women for their services. Does it just start out with you going to them for face powders and then it escalates? Or, would you just go and ask for poison right out of the gate? How does the relationship develop? I think that there were probably many approaches. Some women probably did just want to go to these midwives/herbalists/abortionists/eventually poisoners for their secrets. One of the biggest products that a few of the women that I research would sell would be face-whitening powders and waters. The whiter you were, it was associated with nobility because that meant you didn’t have to work outside in the fields. It’s a way of distinguishing yourself. So it was very possible that some women had just heard that this is the new latest thing, that this midwife/herbalist had the best beauty products around. And then she may be introduced to some of the other services later, as she needs them. But there are some women who are going to the midwives/herbalists/abortionists under the guise of buying these things. It was their cover. Right? When actually they were coming because they were maybe pregnant with an unwanted pregnancy and had heard that if you talked to the midwife/abortionist just right, she may offer you her services. And of course the women who were offering the services were really very careful about who they brought into their homes, because they knew that they were doing an illicit business. There’s one story—so the main woman I look at is a woman is named Catherine Voisin. And there was a record of a noblewoman basically knocking on her door, saying “I need your help, I’ve got something in my stomach I don’t want.” And Catherine didn’t know who this woman was and she said, “Madame, there’s a church right next door. Go pray, maybe God will help you.” And the woman said, “But you don’t understand, I have money, I’m willing to pay.” It’s almost out of a movie scene in a way, all of the sudden—“Oh, really?” So there’d be these negotiations that would take place until the midwife was ready to offer some of the more scandalous services. Well, you want to make sure you’re not dealing with a narc, right? That’s rule number one of illicit services. Exactly! And the police chief was getting really good at employing undercover spies. So it was truly an undercover network where, to get the services you want, you needed to have basically an introduction from somebody that Catherine trusted. Some women just wanted to come in to have their fortunes read. But there’s another episode in which a woman sent her servant in to speak to Catherine. She says, “Okay, my mistress is going to be coming in with her husband and asking to have her husband’s fortune read. As you know, he is a very sick man. It’s likely he won’t live for long, hint hint.” And so then, sure enough, the mistress and her husband come in, she reads his hand and says, “Oh, it just doesn’t look good.” And the servant leaves a fancy bracelet on one of the tables for the fortune teller and then later on we find out that it’s true, he did recently die. Oh, and it was foretold in the stars. When actually later on, one has to assume given his symptoms and the fact that the police chief was interested in this particular mistress, it was all sort of the preliminaries to actually having the husband poisoned. It was all this ruse. Circa 1690, The royal gardens at the Palace of Versailles, south-west of Paris, designed by Andre le Notre. Photo via Getty. It’s really interesting, the way you paint this picture of this world of women going around the existing structures of society. Part of what we’re dealing with here is women have this specific knowledge that society and also specifically men distrust. And the women who come to them, it’s women who want to kill their fathers or women who are competing with scheming mistresses. It’s interesting this world that you are painting here. And this is why I was so happy that Jezebel wanted to interview me, because I knew the questions would be really smart around women. In other interviews, I’ve tried to do what I can to talk about the social dimensions of it but I think the story itself is so scandalous and so titillating that those larger social issues get lost. Why were so many of the midwives/herbalists/witches/poisoners women? And why were so many of their clients also women? And why was the main objective of all of them either to gain a man’s affections—in this case, many of the women were in Louis XIV’s court and they were coming hoping to get some sort of love potion to get the king to fall in love with them. Why is that? Because a woman’s place at court was really dictated by the position of her relationship to a man. And the higher she could go, the more social status she would have. Why also were women seeking abortions? Well, because childbirth was an expected thing, a typical woman in this time period could expect to have at least six pregnancies during her lifetime and with each pregnancy taken to term, she would have a one in six chance of dying. The odds were really high that, even though women were expected to get pregnant, there were women who were probably scared literally to death. Or in the absence of reliable and accessible birth control in this time period, there were also probably unintended pregnancies. Then the final thing is, why the poison? Well, many of these women are trying to poison their husbands. These are arranged marriages, and oftentimes arranged marriages to older men. The women may not have been treated well; they may have felt trapped. All of this seems quite evil. And Catherine is really just this terrifying person. But it really goes to those women trying to access power that they don’t have or that was forbidden to them. Right? And women going into business, creating entire industries around trying—in the darkest of ways—to empower these women who really didn’t have a lot of power in society. That’s a long answer, but that’s the first time I’ve gotten to say it like that, so I’m glad you offered me that chance to say it. Francoise de Montespan, one of Louis XIV’s mistresses and probably a client to Catherine Voisin. Photo via Getty. It was so striking because there’s one scene in particular where you’ve got Louis XIV, his wife, and maybe two of his mistresses? Louis XIV supposedly loves and respects all these women, but they’re all being humiliated on this very public stage, desperately competing for his affections. It’s a very cruel system. And when I was researching and discovered he had his wife, his current—they call it “mistress in title”—recognized mistress who was on the outs and who was pregnant, and the woman that he would bed in the week or so to come, all in a single carriage. And to be in that small space, and to have every single one of the women in Louis XIV’s entourage be both the humiliation of another and also humiliated themselves. So, the dynamics among the women are just so very complicated. They’re all in the same boat, but they’re all aiming for the same prize, and at any moment with a glance of the king, they could be in the greatest of favors or they could be reduced to nothing, which made these women all their worst enemies. Yeah, you can’t even band together and pull some Survivor-style alliance to make it more bearable. Right, right. It had to be an extremely neurotic-making and isolating environment. You talked about how there’s a lot of cultural anxiety about these women—they can deliver your child safely, but maybe they’re witches and they’re going to poison you. So then, as a historian, how do you separate what really happened from what somebody like Nicholas de la Reynie thinks is happening? Especially since, as your book makes very clear, torture was an accepted part of police procedure at this point in history. I think this is where being a cultural historian and having worked for so long in this period, I’d like to think—I think it would be arrogant to say that I do—I’d like to think that I have a pretty good sense about just what’s in the air. Right? The common fears, prejudices, the way the world is conceived, and it was a foregone fact that women could be very evil. That’s how the police chief begins his investigation. And when you’re looking for that, you’re going to find it. Particularly when the arrests all began happening and people were being interrogated, and in a society where it’s every person for themselves, it was really tricky to be able to separate fact from fiction in the accounts that these people were giving. And so it was really important to me to only represent what I could know for sure. And how I was able to feel comfortable about that, is truly taking something of a lawyer/judge perspective and weighing all of the different evidence and all of the different accounts that we have available and doing a fair bit of cross checking. If this person says that they were at this particular place on that specific date with the King, first I need to check was the King really there at that date, and is the mistress really there at that date. Okay, great. Now, who is the person making that account and can I find corroborating accounts? Yes. Okay, great. Now, is what they’re telling in the realm of possibility? Sure, but what’s at stake for them, do they know each other? You can see that complicated process. It really did feel like I was some sort of, I don’t know, I said I was a judge, but it felt like I was some sort of FBI agent, too. It’s good because I was able to do it thru la Reynie’s eyes. There were certain things he would clearly dismiss in his writings as being too fanciful and not trustworthy and he would actually give me the reasons why he found that not to be trustworthy and, you know, then I would be able to later see that that bore itself out. It was like watching one of those Law and Order episodes where you think they’ve solved the mystery but there’s wiggle room. Because that’s the way crime works, right? Most of the time there’s not a smoking gun. And then wondering what the king himself believed about these things. Right? In the end la Reynie just sort of had to throw his hands up. It’s a little bit like—okay, I can give you this evidence. There are things I’m sure of, there’s things I can’t be sure of, it’s up to you to decide. And Louis XIV’s two ministers basically say, “Hey, just stop this.” And Louis XIV says yeah, you’re right. But if he didn’t believe this were possible, first, why start this secret tribunal? If he didn’t believe it were possible, why ask for all the documents to be under seal? And then why burn the evidence? And then why send some of the most horrible suspects to these horrible prison experiences where they’re not allowed to utter another single word, ever? Everybody’s not sure that it happened, but everybody’s pretty sure that it could have happened. I was trying to get my head around this—obviously this is a very Christian world, and clearly, if you’re going to bother summoning Satan, obviously you believe in him. But if you believe he’s real, why would you ever call him up on the phone? You know, I hadn’t really thought about it that way. But there is no question that every single one of these people, it’s part of the mindset: there is a God, and through Catholic church rituals, you can access higher powers. That is a foregone conclusion in this society. And there are tensions between Protestants and Catholics throughout Europe at this time period. We’re past the religious wars but there’s still tensions. In fact Protestant women were not allowed to be midwives. Midwives, because they were so suspect and suspicious, in Paris, where they tried to have control over midwifery, midwives had to basically assert their moral fabric. They had to demonstrate that they were women of good standing and they would also have to make confession in the churches to demonstrate that they were good Catholic women. But they all believed in God and they all believed, Catholics and Protestants alike, that you, there was a devil and there was a hell. And so these women—their desires to have whatever they wanted fulfilled on earth must have been so strong that they were willing to risk damnation after life.